This handsome guy is Popeye. 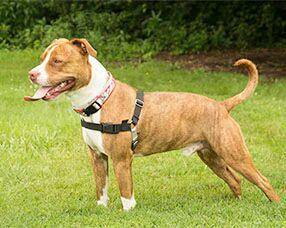 He's a Pitt Bull Terrier mix and only a little over a year old. 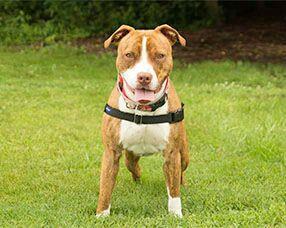 According to shelter staff and volunteers, Popeye is a happy, smart, athletic boy. Just look at that smile! Hi there, I'm Popeye! I'll bet you noticed my big, beautiful smile! You'll find that I wear that a lot, because I'm a happy, playful boy and I love people. I'm 47 pounds of love and muscle, plus I'm outrageously handsome, smart and athletic. With all those things going for me, it's hard to believe I'm homeless, isn't it? Well...that won't be for long, because the word is getting out about what a great all around guy I am! Let me tell you more! When I first got to Wayside, everyone here was impressed by my good looks and intelligence, and I acted very much like a happy, VERY energetic puppy. It was all fun and games for me, but for a dog of my size and strength, silly puppy habits are not always appreciated! Lucky for me, the expert staff here knew I was a perfect candidate for a training program here at Wayside that they call the "Peace Academy." During my time in that program, I learned things that help me control my impulses. Brace yourself, because here are just a few of the commands I have mastered...sit, down, come, look, stay/wait, target, off, leave-it, drop-it, and touch! Whew....pretty impressive, isn't it? I graduated from Peace Academy with honors! I guess I'm bragging a little, but it will be important for us to practice these commands once we get home. This will help me focus my attention on what you want, and help me remember my manners! Because I'm high energy and still have a bit of a rough play style, I'm looking for an active home with no kids under 5. Oh...I almost forgot to tell you how great I am in playgroups here with other dogs! The staff here describes me as "da bomb" in playgroups! In case you're not familiar with that term, it means I'm an awesome play mate, especially for dogs with a similar energy level. After a play session, I love cooling off in the kiddie pool. I am sometimes a little serious about my food, so I'll need a safe place to eat, away from kids and other dogs. That's no big deal....nobody likes to be bugged while they're eating, do they?! It's hard to learn perfect house manners when you're living in a shelter, so I'll probably need a refresher course in housebreaking once we get home. I'm smart and will do just fine once I get used to my new environment, and we get our routine established. I don't mean to make you panic or anything, but word is getting out about how awesome I am, and there's a line forming in front of my kennel for people who want to make me a part of their family! You'd better come on out to Wayside - I am ready to go home with you NOW!!! Oh, he looks like a good boy! Will tweet! Hmmm. Operator error on my part I'm sure but I can't seem to get this to tweet from my phone. Will have to come back later! Now that's such a wonderful happy smile! We'll share this handsome dude. Oh I'm sure he'll find a wonderful home soon! He looks such such a good boy, and I love that he graduated with honors. He'd be the perfect match for an active family. Hoping he finds his forever family soon. 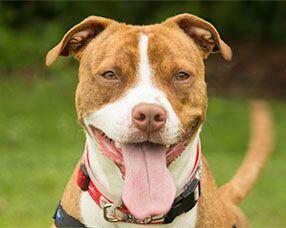 What a handsome guy - hope he finds a home soon. I hope he finds a home soon, he sounds lovely. Popeye is one handsome dude! Sharing.